Le Méridien Pyramids, nestled between the city and the wilderness, boasts unparalleled views of the majestic, ancient splendour of the Giza Pyramids. A mere glance out a guestroom window reveals one of the Seven Wonders of the World. Le Méridien Pyramids is surrounded by landscaped gardens, providing a respite of greenery amidst golden sands. 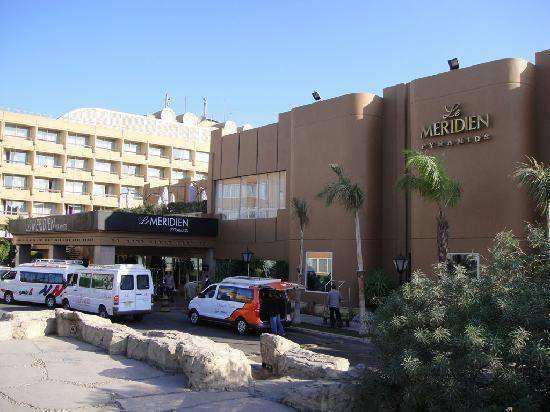 With a peerless choice of restaurants and cuisines, a Royal Club floor, a magnificent swimming pool, and spa amenities, Le Méridien Pyramids is conveniently located only twenty minutes from Cairo’s city centre. No penalty for cancellations up 07 days destination time. Cancellations made 06 days before arrival will be assessed 1night(s) room rate. Cancellations made 01night before arrival will be assessed 100% of the total stay amount. No-shows will be assessed 100% of the total stay amount. If amendments are permitted, the following Amendment conditions may apply. Changes to arrival/departure date, room type or name change or where special offers were applied at the time of the booking may result in the item re-pricing. This price does not include any applicable resort fees, city taxes, other hotel mandatory charges, or charges for optional incidentals.